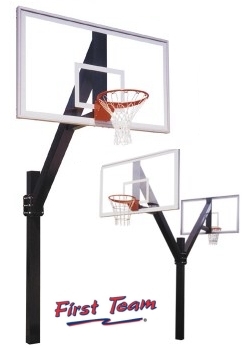 Post to backboard extension is 66"
The Legend offers exceptional rigidity, uncompromising durability and maximum safety on even the toughest courts! Built from heavy 6" square 3/16" thick steel tubing, the Legend provides unmatched stability and durability. Designed for the most rugged playgrounds, the Legend performs under even the most aggressive play. The direct bury post is positioned 66" behind the backboard for safety. The extension arm on the Legend is attached to the veritcal post via six 5/8" high tensile bolts. Though the Legend is considered a "fixed height" goal, the extension arm can be bolted at any height along the post.